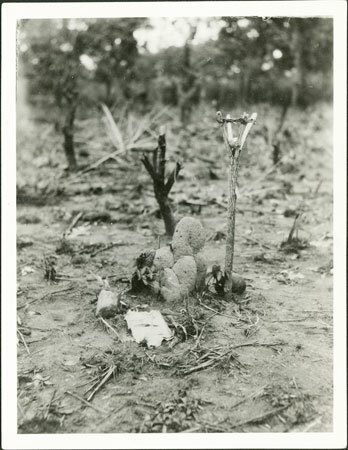 A tuka or spirit shrine in a garden, showing a split stick, the ends bound at the top, with ritual offerings in the split of the stick and on the ground below under an upturned pot. Such shrines are sites for medicines or ngua that are invoked to ensure ancestral (spirit) favour for the garden. This tuka was erected on the occasion of sowing a garden. Contemporary Publication - Reproduced as Plate XI (page 240) in E. E. Evans-Pritchard's article 'Witchcraft (Mangu) Amongst the Azande' Sudan Notes and Records, Vol. XXII, No. 2, 1929. Morton, Chris. "Zande spirit-shrine in garden" Southern Sudan Project (in development). 03 Jan. 2006. Pitt Rivers Museum. <http://southernsudan.prm.ox.ac.uk/details/1998.341.233.2/>.